Hi all, in this article I wanna sort and share some experience about creating and using the internal Kubernetes cluster. For the last few years this container orchestration tech made a great step forward and became a some kind of corporate standard for the thousands of companies. Some of them use it in production, some just test it inside their projects, but anyway there is a strong passion about it in IT community. So if you never used it before, it’s definitely time to start dive in to it. 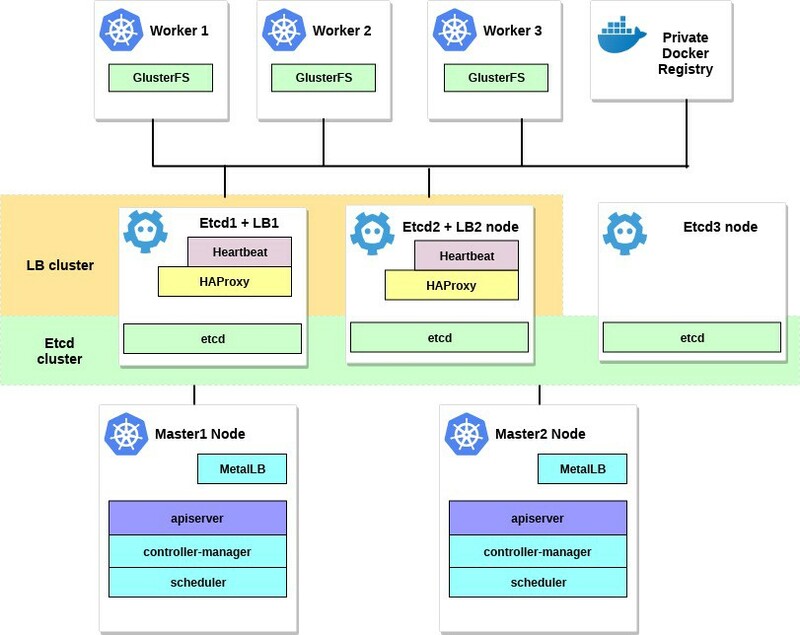 Kubernetes it’s a scalable orchestration technology, it can start from single node installation, up to the really big HA clusters, based on hundreds nodes inside. Most of the popular cloud providers, represent the different kind of Kubernetes implementations, so you can start using it very fast and easy in there. But there is a lot of situations and lot of companies that can’t use clouds for their needs, but they wanna get all benefits from the modern technologies of using containers also. And there bare metal Kubernetes installation comes on the scene. In this example we’ll create a HA Kubernetes cluster with multi masters topology, with external Etcd cluster as base layer and a MetalLB load balancer inside. 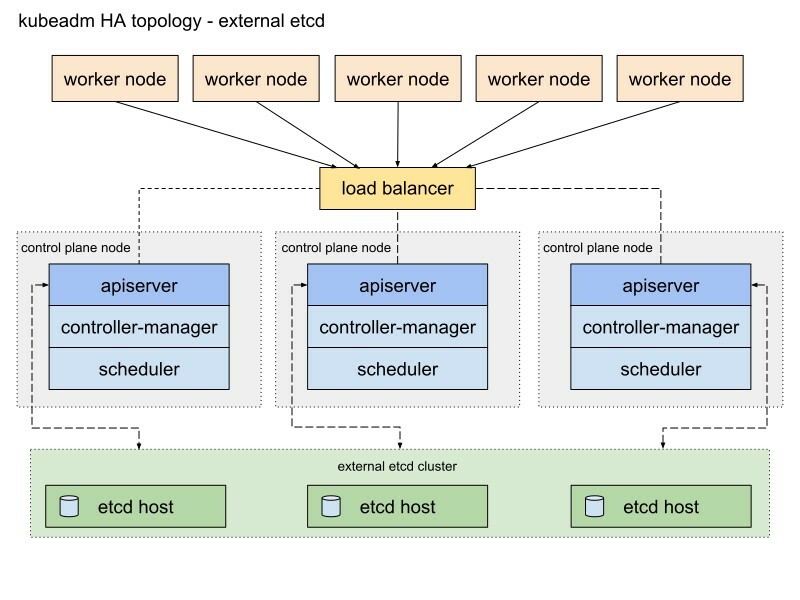 On all worker nodes we’ll deploy a GlusterFS like a easy internal distributed cluster storage. Also we’ll try to deploy some test projects in it, by using our private Docker registry. Actually there is a few way in which we can create our HA Kubernetes cluster, hard and deep journey described in popular kubernetes-the-hard-way document, or more simple way using kubeadm utility. Kubeadm it’s a tool that was created by Kubernetes community exactly for simplifying the Kubernetes installation and making this process more easy. Previously Kubeadm was recommended only for creating small single master test clusters, just for getting started purposes. But for the last year there was many improvements done on it and now we can use it for creating multi masters HA clusters also. According to Kubernetes community news, Kubeadm will be a recommended tool for Kubernetes installation in the future time. Kubeadm documentation propose a two main way of cluster implementing, with stacked and external etcd topology. I’ll choose a second way with external etcd nodes, because of fault tolerance reasons for the HA cluster. I’ll change this schema a bit. First, I’ll use a pair of HAProxy as load balancers with Heartbeat that will share a virtual IP between them. Heartbeat & HAProxy use a small count of system resources, so I’ll place them on pair of Etcd nodes, to decrease a servers count for our cluster a bit. For this Kubernetes cluster schema we’ll need eight nodes. A three servers for external etcd cluster(also LB services will use pair of them), two for the control plane nodes (master nodes) and three for the worker nodes. It can be bare metal or VM servers, it doesn’t matter. You can simply change this schema by add more masters and placing HAProxy with Heartbeat on separated nodes, if you have a lot of free servers. But in fact my variant be a quite enough for the first HA cluster implementation. Optionally you can also add a small server with installed kubectl utility, for managing this cluster, or you can use your own Linux desktop for it. We need two Kubernetes master nodes with minimum recommended system requirements of 2 CPUs and 2 GB of RAM according to the kubeadm documentation. For the worker nodes I’ll recommend to use more powerful servers, as we’ll run all our application services on them. And for the Etcd + LB we can also take servers with 2 CPUs and 2 GB of RAM minimum. Also choose some public or private network for this cluster, it no really matter, what kind of IPs you’ll use, important that all servers must be reachable for each other and for you of course. Inside Kubernetes cluster we’ll configure an overlay network later. 192.168.0.1 — HAProxy virtual IP, 192.168.0.2–4 Etcd & HAProxy nodes main IPs, 192.168.0.5–6 Kubernetes masters main IPs, 192.168.0.7–9 Kubernetes workers main IPs. Debian 9 base installed on all servers. Also mind that system requirements depends of how big and powerful cluster you need. Read a Kubernetes documentation for the addition information. 3. Configuring HAProxy & Heartbeat. As we’ll have more the one Kubernetes master node we need to configure a HAProxy load balancer in front of them, to distribute the traffic. It’ll be a pair of HAProxy servers, with one virtual IP that they will share. Fault tolerance will be organised by Heartbeat. We’ll use a first two Etcd servers for deploying them. As you can see, both HAProxy services will use 192.168.0.1 shared IP address. This virtual IP will moved between servers, so we need to make some trick and enable net.ipv4.ip_nonlocal_bind sysctl option, to allow system services binding on the non local IP. OK, now we’ll install Heartbeat and configure this virtual IP. Now it’s time to create a few configuration files for it, they will be mostly the same for the first and second servers. Next let’s create a main configuration file for Heartbeat on both servers, it’ll be a bit different for both of them. The “node” parameters for this config you can get by running uname -n on both Etcd servers. Also use your network card name instead of ens18. You can check that HAProxy working OK running nc to the 192.168.0.1 6443 address. You must got a timeout, as there is no Kubernetes API listening on backend yet. But it means that HAProxy and Heartbeat configured well. 4. Preparing nodes for Kubernetes. At next step let’s prepare all Kubernetes nodes, we need to install Docker with some addition packages, add Kubernetes repository and install kubelet, kubeadm, kubectl packages from it. This setup will be the same for the all Kubernetes nodes (masters, workers and etcd). The main benefit of Kubeadm is that you not need a lot of addition software you only need to install kubeadm on all your hosts and then use it, you can even use it for the CA certificates generation. You can install kubectl optionally, but I often install it on all nodes, to get availability to run some Kubernetes command for the debugging reasons. After you finishing with installing kubeadm and rest packages, don’t forget to disable swap. Repeat this installations process on rest of the nodes. Software packages will be the same for the all cluster nodes and only next configuration will determine each roles they will get later. Alright, after all preparations was finished we now can start with configuring our Kubernetes cluster. First brick will be a HA Etcd cluster that also be setuped with kubeadm tool. Before we begin make sure that all etcd nodes can talk to each other over ports 2379 and 2380, also you need to configure a ssh access between them for using scp. We’ll start on the first etcd node, and then just copy all needed certificates and config files on rest servers. Then ssh to the first etcd node, we’ll use this node to generate all needed kubeadm configs for each etcd nodes and then will copy them. This command will create two files ca.crt & ca.key in /etc/kubernetes/pki/etcd/ directory. Then let’s copy certificates and kubeadm configs to the etcd2 and etcd3 nodes. First generate a ssh key pair on etcd1 and add public part to the etcd2 & 3 nodes. In this example all commands be done from the root user. The etcd cluster is UP and we can move forward. Move the previously copied certificates and key to the properly directory on master1 as we listed in config. Copy this kubeadm init output to some text file, we’ll use this token in future when will join the a second master and worker nodes to our cluster. As I said previously our Kubernetes cluster will use some overlay network inside, for the Pods and other services, so at this point we need to install some CNI plugin. I recommend a Weave CNI plugin, after some experience I found it more useful and less problem, but you can choose another one like Calico or other. It’s recommended to join new control plane nodes only after the first node has finished initialising. Cool, the first master node is UP and ready, now we can add second master node and add our workers nodes, to complete the Kubernetes cluster creation. Now let’s join the second master node to the cluster, for this we’ll need a join command output, that was previously given to us by kubeadm init on the first node. We need to add the --experimental-control-plane flag. This flag automates joining this master nodes to the cluster. Without this flag you’ll just add a regular worker node. Well done, we almost finished with our Kubernetes cluster configuration, the last thing we need to do, it’s add the three worker nodes that we prepared previously. Login to worker nodes and run the kubeadm join command without --experimental-control-plane flag. As you can see we now has a fully configured HA Kubernetes cluster with two master nodes and three worker nodes. This cluster based on a HA etcd cluster with fault tolerance load balancer in front of our masters. Sounds good as for me. One more things that we left to do in this first part of article, configure a remote kubectl utility, that we’ll use for controlling our cluster. Previously we run all commands from the master1 node but this is good only for the first time, when we configuring cluster. Then configuring some external control node will be a good idea. You can use your laptop or other server for it. Good, now let’s run some test pod in our cluster and check how it work. Congrats, you just run your first Kubernetes deployment. And it mean your new HA Kubernetes cluster ready. Actually the Kubernetes cluster configuration process using kubeadm a pretty easy and fast. In the next part of article we’ll add the internal storage by configuring a GlusterFS on all worker nodes, and will configure a internal load balancer for our Kubernetes cluster and also run some stress tests by shutdown some nodes and check how stable cluster can be. Well, implementing this example you can meet some problems, don’t worry, for cancelling any changes and returning your nodes to the base state you can just run kubeadm reset, it’ll totally remove all changes that kubeadm was done before and you can start your configuration from scratch again. Also mind to check a docker containers state on your cluster nodes, to be sure that all of them starts and working without error. For getting more info about bad containers use docker logs containerid. That’s all for now, good luck.